Baker graduated from De La Salle High School (Concord, California) in 1999 before attending the University of California, Berkeley. As a junior in 2002, he led the Pac-10 Conference with a .383 batting average and was selected to the All-Pac-10 team. Baker was drafted in 2002 by the Oakland Athletics in the 4th round of the amateur draft. He was mentioned several times in Michael Lewis' 2003 book Moneyball. In March 2007, Baker was traded to the Florida Marlins for minor league first-baseman Jason Stokes. Baker was called up to the majors on July 9, 2008, after Matt Treanor went on the disabled list. 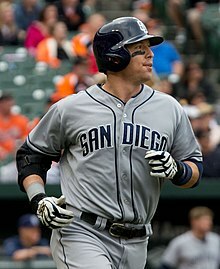 His first major league hit was a solo home run off Chan Ho Park of the Los Angeles Dodgers on July 10. In 2009 to 2010 Baker platooned with teammate Ronny Paulino; Baker played against right-handed pitchers while Paulino played against left-handed pitchers. Baker went on the disabled list in May 2010 with a strained flexor tendon in his right arm. At the end of the 2010 season, he had Tommy John surgery when the elbow did not improve. He spent most of 2011 rehabbing and rejoined the Marlins that September, serving primarily as a pinch hitter. On November 22, 2011, Baker was traded to the San Diego Padres for Wade LeBlanc. Baker served as backup to Nick Hundley and Yasmani Grandal in 2012, starting 52 games and batting .238 while throwing out 16% of base runners. In 2013, he began the year as the backup to Hundley. He started 12 games for the Padres in April and May, and then was optioned to the Triple-A Tucson Padres when Grandal returned from his 50-game suspension. He was designated for assignment on June 10, 2013. Baker was claimed off waivers by the Los Angeles Dodgers on June 15, 2013 and optioned to AAA Albuquerque. He was outrighted off the 40 man roster on August 5. In 40 games with the Isotopes, he hit .203. He became a free agent on October 1. On December 13, 2013, Baker signed a minor league deal with an invitation to spring training with the Chicago Cubs. Baker won the backup catcher job out of spring training when George Kottaras was released. On July 29, 2014, Baker pitched a scoreless top of the 16th inning with a popout and double play, as the Cubs had exhausted their bullpen in a game against the Colorado Rockies. In the bottom half of the inning, he walked from a full count, then reached third with the bases loaded and one out. He scored the winning run on a lineout by Starlin Castro, earning him the win in the longest game, by time, in Cubs history. Baker became the fourth position player to earn a win since 1968, and first since Chris Davis did so in 2012. John is the only Cubs position player to ever be credited with a pitching win in the history of the franchise. Baker signed a minor league deal with the Seattle Mariners on January 29, 2015. He was released on May 20, 2015. During the offseason, Baker has taught Physical Education at St. Isidore School in Danville, California, where his wife, Meghan, used to teach. Baker enjoys broadcasting. He had a stint as a co-host with Rick Tittle on the SportsByline USA radio network. Baker is a philanthropist who was nominated for the Roberto Clemente Award. He visited the troops in the Middle East and helped victims of the earthquake in Haiti. After leaving Berkeley to begin his baseball career, Baker chose to not finish his degree at Berkeley, ultimately completing an online Bachelor's through Arizona State. ^ "John Baker Rejoins Cubs As Baseball Ops Assistant". ^ "San Diego Padres acquire catcher John Baker from Miami". Padres Press Release. MLB.com. November 22, 2011. Retrieved 11 March 2013. ^ "A's trade catcher John Baker to Florida in Minor League deal". MLB.com. March 30, 2007. Retrieved August 27, 2014. ^ Rodriguez, Juan (September 2, 2010). "Catcher John Baker to undergo Tommy John surgery". Sun Sentinel. Retrieved 11 March 2013. ^ Eddy, Matt (November 28, 2011). "Marlins Deal John Baker To Padres For Wade LeBlanc". Baseball America. Retrieved August 27, 2014. ^ "Miami Marlins trade C John Baker for LHP Wade LeBlanc". Sun-Sentinel. November 22, 2011. Retrieved August 27, 2014. ^ "Padres reinstate catcher Yasmani Grandal from Restricted List; Option catcher John Baker to AAA Tucson; DFA INF Edinson Rincon". Padres Press Release. MLB.com. May 28, 2013. Retrieved July 21, 2014. ^ "Padres reinstate INF Logan Forsythe from 60-day DL and place INF Jedd Gyorko on 15-day DL". MLB.com. June 10, 2013. Retrieved August 27, 2014. ^ Stephen, Eric (June 15, 2013). "Dodgers claim catcher John Baker from Padres, option him to Triple-A". True Blue LA. SBNation.com. Retrieved July 21, 2014. ^ "Pacific Coast League Transactions - MiLB.com Stats - The Official Site of Minor League Baseball". MiLB.com. ^ Wittenmeyer, Gordon (March 26, 2014). "Guitar-strumming catcher John Baker wins a spot in Cubs band". Chicago Sun-Times. Retrieved July 21, 2014. ^ Gonzales, Mark (July 30, 2014). "Cubs win longest game in team history". Chicago Tribune. Retrieved July 31, 2014. ^ Klopman, Michael (July 30, 2014). "Cubs Catcher John Baker Pitched A Scoreless Inning And Then Scored The Winning Run". The Huffington Post. Retrieved July 30, 2014. ^ "Seattle signs C John Baker to minor-league deal". ESPN.com. Associated Press. January 29, 2015. Retrieved January 30, 2015. ^ Johns, Greg (January 29, 2015). "Baker finalizes Minor League deal with Mariners". MLB.com. Retrieved January 30, 2015. ^ "John Baker named Marlins nominee for the 2010 Roberto Clemente Award presented by Chevrolet". MLB.com. September 13, 2010. Retrieved 11 March 2013. Wikimedia Commons has media related to John Baker (baseball).